Acne may have ruined your adolescence, but as it creeps into adulthood, you may be more and more fed up with it. The term for adult acne is acne vulgaris, and that is an apt name. It manifests itself in ugly pustules across the face. These can sometimes leave scars that last for a lifetime. You might assume that acne will say behind you once you leave your teenage years behind. However, it can follow you throughout your life, and this often has little to nothing to do with you. Acne causes are not always apparent; even dermatologists cannot always determine the cause of adult acne. 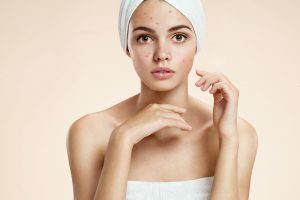 While acne in adults may not be as severe as it is in teens, it can be just bad enough to give adults the taste of the emotions associated with acne in high school. This can lead them to seek treatment, and luckily, acne treatment is better than ever. Your skin is made up of millions of tiny follicles that each contain a tiny, barely visible hair. Different substances are exuded from these follicles, such as sebum, oil, and sweat. When the liquid, no matter the type, comes all the way out of the follicles, your skin stays clear. However, the liquid can become stuck in the follicle. When this blockage happens, the follicle is stretched, which allows bacteria the opportunity to grow and multiply within the follicle. This is known as a comedo. If the wall of the follicle happens to rupture, the immune system will attack the bacteria within the comedo. This leads to red skin and inflammation. Acne in adolescents is caused by the sebaceous glands which produce sebum beginning during puberty and continuing throughout the remainder of life. 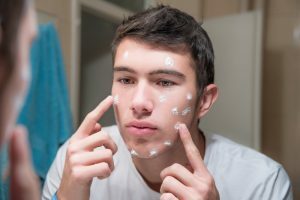 However, dermatologists are unsure of why these glands can continue to cause acne in men later in life, while some men never experience adult acne. Likely, it has to do with genetics, diet, or environment. Some of the leading theories as to what cause acne are stress, drying of the skin, and exposure to chemicals and toxins. Stress can change hormone levels which can lead to an overproduction of sebum. Using products to dry the skin may also cause an excess of sebum, which your skin produces in excess to make up for the lack of moisture. Chemicals that are found as additives in some cleansers can also lead to more acne rather than helping to treat it, so make sure you read labels carefully. Your lifestyle may also contribute to acne. Eating unhealthy foods, as well as foods with excess grease and oil, can potentially lead to acne. Drinking has also been linked to an increase in acne. Prescription drugs may also occasionally cause breakouts. The basic principle of treating acne is keeping hair follicles open via the use of cleansers such as exfoliants to remove dead skin cells. Typically, these cleansers are available over the counter. They also tend to include ingredients that aid in preventing follicle blockage in the first place. Benzoyl peroxide, which is used to break down bacteria that infects follicles and can lead to infection. Salicylic acid, which can unclog pores, but the relief is usually only temporary unless it is used on a daily basis. There are several other ways to treat acne, though they usually need to be prescribed by a professional. These products can cause other harms, however, and should be taken in moderation as well as under a doctor’s supervision. Derivatives of vitamin A, or retinoid, can unclog pores but also keep them unclogged. Antibiotics, either topical or oral, can prevent the spread of bacteria. Corticosteroids, which are anti-inflammatory medications, can be injected into the site of inflammation, such as a cyst or pustule, in severe cases. Find a skincare routine that is thorough, natural, and that you can do each day. Know your skin type (oily, dry, combination) and center your product choices on that. Using the wrong skincare products can lead to more acne, despite your best intentions. Start with a cleanser. Again, find one that suits your personal skin type. Wash your face no more than twice a day. Once in the morning and once in the evening should be enough. Follow this with a gentle exfoliant twice a week but be advised: if you have sensitive skin or if you have a more severe case of acne, try not to exfoliate more than once a week. Toner is a hot debate in the skincare world. While some believe that it will disrupt your skin’s natural pH, it can also have a whole host of benefits if you choose the right one. After exfoliating, follow with a light toner that is specific to your skin type and skincare goals. The final step in any complete skincare routine is to moisturize. This may seem counterintuitive, especially to those of you with oily skin types, as we just purged the skin of all of its oil. Why would we replace the oil with more oil? Without moisturizer, your sebaceous glands will overproduce sebum, leading to only more breakouts. Apply a thin layer of moisturizer to your skin. Do your best not to over apply moisturizer. After all of this, you will have a hydrated and balanced face, leading to less acne. While the exact causes of adult in adults is unknown, there are lengths that you can go to in order to reduce your risks of breakouts. A healthy lifestyle, low stress, and a thorough, balanced skincare routine are your best friends in the fight against acne. If you do develop a popup pimple, do not distress. It is definitely normal. Just keep cleansing, you will be just fine.